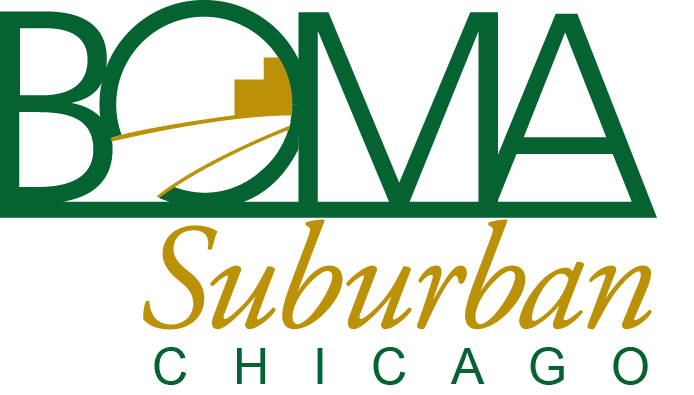 BOMA/Suburban Chicago offers its members a variety of resources to help them become more effective and successful in their careers. From industry news and benchmarking data, to job postings and advocacy news, we have the information in commercial real estate that can keep you at the top of your game. BOMA/Suburban Chicago maintains resumes on file. We accept resumes from property professionals at all levels, including building engineers and administrative staff. These resumes are held on file and made available to companies that are hiring. BOMA/Suburban Chicago's members, committees, and staff strive to provide members with the most current and up-to-date industry related news and information. When you need resources on relevant topics pertaining to commercial and industrial real estate, we make it easy to find what you need. FOCUS Newsletter is a member-exclusive, bi-monthly newsletter that is mailed to both Regular and Associate members. 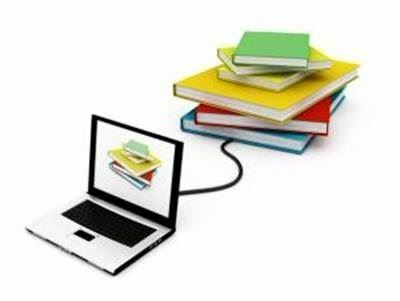 It is also provided electronically to members in our electronic newsletters, Weekly Connections and BOMA Associates Monthly (BAM) after the issue is mailed. 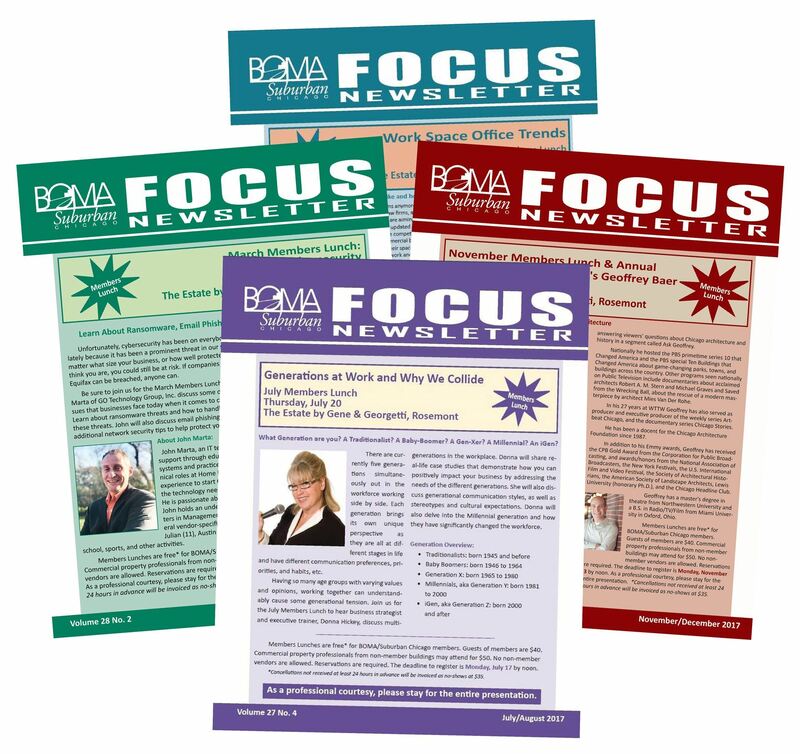 FOCUS provides an overview of past BOMA events, promotes upcoming events, and provides industry related articles to ensure members are informed of the latest trends, issues, and relevant topics. 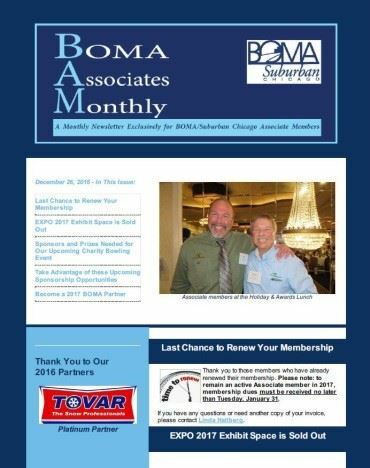 BOMA Associates Monthly (BAM) is an electronic newsletter exclusively for BOMA/Suburban Chicago Associate members. This newsletter is sent on the last Monday of every month and offers a variety of information tailored specifically to our vendor members. This newsletter is a great resource for learning about sponsorship and networking opportunities available through BOMA, which can maximize a company’s impact and lead to greater success through their membership. BAM also provides unique and valuable tips that are relevant to vendors to help them grow their business and increase their success. 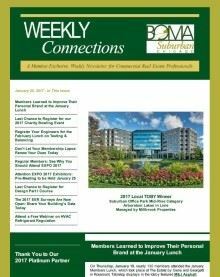 Weekly Connections is the official weekly, electronic newsletter for members of BOMA/Suburban Chicago. This is your member-exclusive source of industry related news, as well as specific information about upcoming events, advocacy news as it pertains to members, education courses, networking opportunities, and much more. Weekly Connections is sent to the member representative every Friday. 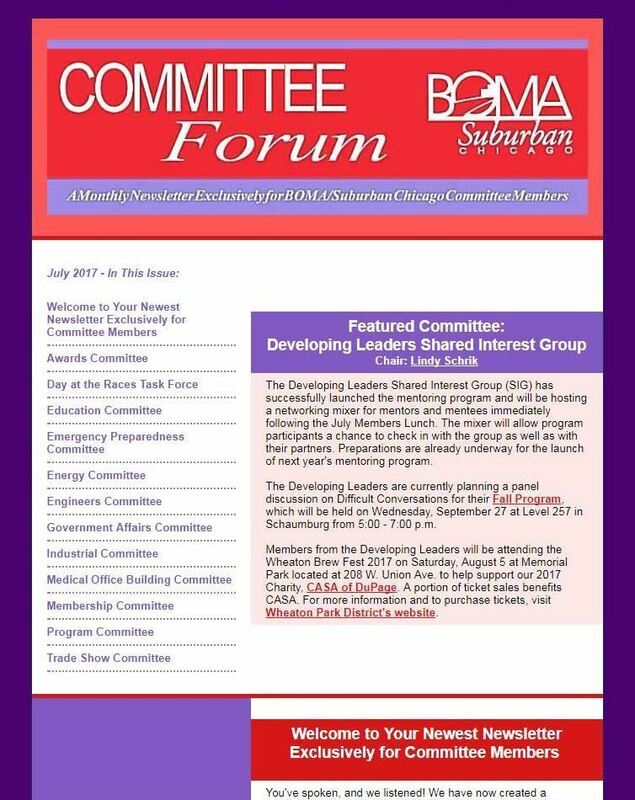 Committee Forum is a quarterly electronic newsletter exclusively for BOMA/Suburban Chicago members who serve on a committee. Committee Forum is sent to all BOMA committee members at the end of the current quarter. This newsletter provides a brief summary of the initiatives and events each committee is currently working toward. Committee Forum was implemented in order to create better communication between the different committees and to keep them informed and help them in the planning of their own events.